As we head closer to Christmas with our A-Zdvent list of iconic seats, S is represented by Danish designer Arne Jacobsen's Swan Chair. 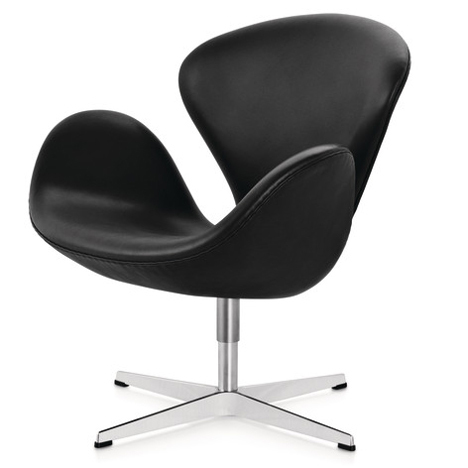 Modernist architect and designer Arne Jacobsen originally created the rounded Swan Chair in 1958 for the lobby and lounge areas of his SAS Royal Hotel in Copenhagen. "The commission to design every element of the hotel building as well as the furniture was Jacobsen's grand opportunity to put his theories of integrated design and architecture into practice," says the architect's official website. Also made in an elongated sofa version, the lounge chair is formed from an upholstered shell that curves up in three separated sections to form a higher back and two lower arms. The seat is made from polyurethane foam around fibreglass reinforcement, supported by a satin-polished steel pedestal mounted on a four-pronged aluminium base. Danish brand Republic of Fritz Hansen has produced the chair since its inception. The Swan Chair was one of a number of now-iconic furniture pieces Jacobsen created while designing the Copenhagen hotel – now called the Radisson Blu Royal Hotel – which had one of its rooms revamped by Spanish designer Jaime Hayón in October. Other designs for the hotel's rooms and lobby included the Egg Chair and the Drop Chair, which only made it into production this year. The Swan Chair was also used to furnish Jacobsen's Danmarks Nationalbank building, which completed seven years after his death in 1971. "While the significance of Arne Jacobsen's buildings was less appreciated, his furniture and other design work have become national and international heritage," said Fritz Hansen.